The author of standard scholarly studies of baptism and eschatology in the NT here offers a comprehensive elucidation of themes for preaching from the Gospels. Beasley-Murray first spells out the homiletical significance of the manner in which the Gospels came to be written down. Subsequent chapters mine the life, miracles, teaching, and parables of Jesus for preachable material. This survey will be useful not only for preachers but for anyone interested in integrating Gospel studies with practical theology.If anyone is qualified to speak confidently about preaching the gospel and the Gospels themselves it is George Beasley-Murray. With decades of academic and preaching experience, Professor Beasley-Murray is uniquely qualified to instruct us as to how to make the Gospels come alive for a contemporary audience. Ever faithful to the biblical text, Beasley-Murray models the very message of Scripture with his careful attention to history and detail, his penetrating analysis of the texts, and his rigorous application of the biblical message. 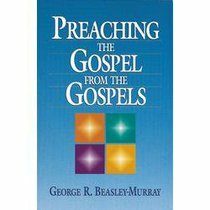 In Beasley-Murray's own words: "To preach the gospel is the prime task of the evangelist, to expound the teaching is an important element of the work of a pastor-teacher of a local congregation. This distinction has proved valuable, and has clarified our approach to the gospels and the New Testament letters. It is plain, however, that it must not be pressed beyond warrant. The 'teaching' may be a handmaid of gospel, and the 'preaching' may be presented through teaching" (from chapter 4). About "Preaching the Gospel From the Gospels"